The target groups for Education via Technology are low income, high-need seniors of various cultures and adults with disabilities. 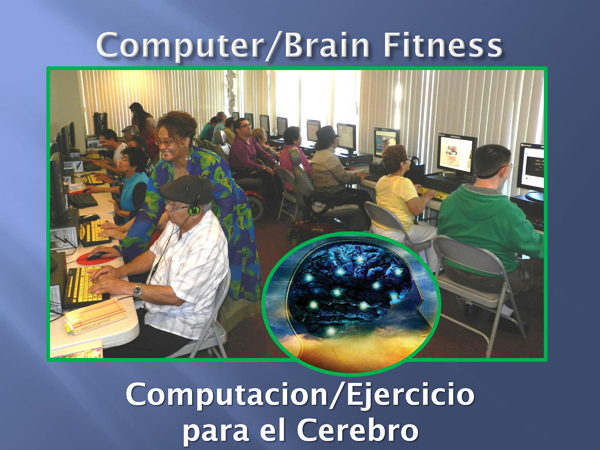 The CIS Computer Learning Center is staffed with a certified instructor from Los Angeles Unified School District Adult School to teach a variety of continuing education courses including but not limited to: computer literacy, adult literacy, English literacy (ESL), Health Education via technology, fraud protection, money management via software technology, home ownership, and foreclosure prevention. The CIS Executive Director has a real estate license and gives workshop seminars to students relative to home ownership and foreclosure prevention. The CIS Computer Learning Center is supported by a consultant in a management position with the California Emerging Technology Fund (CETF). The overarching goal of the Computer Learning Center is to close the Digital Divide for under-served, under-educated populations and cultures. The curriculum is fluid year-to-year, resident (student)-driven, and designed to assist people with self-sufficiency in a variety of domains; preventive health, economic/financial, and enhanced social participation (and respect) in society. The Computer Learning Center was previously funded with a $50,000 grant over 2 years from Verizon Foundation to support Health Education via Technology. With this investment, the CLC now hosts a PositScience Brain Fitness Gym with a scientifically proven formal program for memory enhancement. CIS was also awarded a grant from IBM for the IBM Reading Companion Program. This is a web-based, self-paced reading program that is used at CIS to enhance reading skills for older adults who use English as a second language and younger adults with developmental disabilities who desire better reading ability.